I like the pastiche of the last supper, sirius. have you seen the Star Wars one? I have not. Where might I find it? I cleaned everything up into a folder so you could see the pic on the desktop. Jay Faircloth created that fine bit of imagery. You can get your own desktops from his .mac site. "Top Secret Cat Crap" LOL. hes pooped, but you dont know where!!! for the star wars last supper, literally just type that into google and youll find it easily. Tetsu, what mods have you got on OSX? not the programs, but the themes. if you know what i mean. For example, mine is using iMetal. Ive also got ShadowClipboard 3, Relaunch, MenuCalendarClock in the menu bar, Docktop on the left, Overflow hidden via dockless and linked to F1 by OneKey, sizzlingkeys for iTunes management with various links to extra buttons on my Revolution VX, Growl, APE um.... i think thats it. and just to clarify, I dont have the HD on the desktop. I far prefer clicking on the Macintosh Face, and use the desktop as a cutting ground for temporary items. iMetal is nice.. I've used it before. On the particular shot I posted here (I change out my theme every now and then). 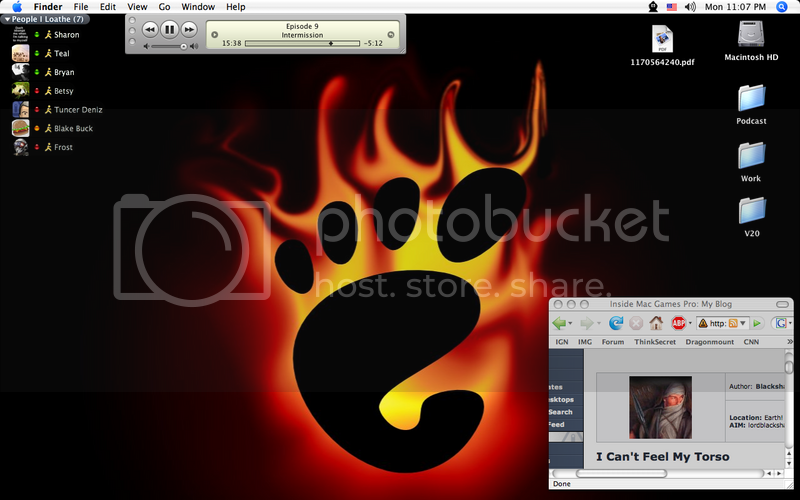 I was using Eternal Aqua... updated by someone at macthemes.net. Now that you mentioned those other programs though typically I myself just use fruitmenu to launch my programs from a customised apple menu (I used to use dragthing but quit using that a while back) and I use the dock just for tasks\a few of the most used programs, I have growl and ape installed of course. The only icons I keep on my desktop are drive icons... as I don't like clutter but I do like having the drives on the desktop. I use WindowshadeX, VirtueDesktops (which will have something similar in Leopard with Spaces), Cleardock (to change the color\opacity of the dock). I use silk to change my system font and I am using Century Gothic. I gave several things to control iTunes a go but I find that I don't really need them.. I don't use them much when I have them. Oh yeah.. and Xounds with a simple glass sound set (unlike some I like system sounds in Mac OS). Slower and faster? I'm sorry to hear such good news? Teflon, can I get a copy of your desktop background? I like it! check it out though, its a nice site and you can find some gems on there... just beware of the fact that you, you know, have to pay and stuff. thanks for the info Tetsu. Ill check some of those things out. 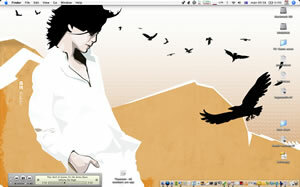 I'm surprised you weren't attracted more to Lemon Lime's desktop than teflon's. With LL's new avatar I thought he was Quicksilver till I read the post. lol... that is harsh. i say we set up a new poll as for who has to change their avatar.... LL or QS... but dont tell them, just get them to vote. also, for one day, and one day only, we need to change LL's username to Michael Yaroshibobble in homage to his surname. The original Nebula avatar from 2001. My modified Nebula avatar for the secret Bork forums (back when they were black and orange). The limited edition™ (sic) Plasma avatar that was yanked after a few days due to its animated behavior. The blue Vortex avatar celebrating my transition from QuicksilverG4 to Quicksilver early last year (some guy registered Quicksilver a few days before me and didn't use it). Now that I see it again, the avatar reminds me of the Intel doodad--how ironic. The improved blue Quicksilver avatar. Ah, how it's grown. i like the idea of changing my name to Michael Yaroshinsky for a day. Chop chop lord brixton, make it happen. no no... thats not how you say it! uh... why not just do command-shift-3 ?? ive set it to produce .jpg files using Macpilot, but theres plenty of apps that do this. I'm going to the vet to get tutored. Beats me what it is. I saw it on the internet one day and thought it looked neat.